Sting has announced a fall concert tour with Shaggy, and it runs from September through mid-October. This fall, Sting & Shaggy will bring their wonderfully dynamic live concerts to North America. Starting off on September 15 at The Fillmore Miami Beach, the 44/876 Tour will make stops at a number of venues along the way, including Atlanta’s Tabernacle, The Theater at MGM National Harbor in Washington, Chicago’s Aragon Ballroom, plus additional Fillmore plays in both Philadelphia and Denver, before ending at The Wiltern in Los Angeles ‪on October 15. All dates that have been released so far can be found below. Sting and Shaggy will be joined on the 44/876 Tour by a combined band including Sting’s musicians ‪Dominic Miller (guitar), ‪Josh Freese (drums) and Rufus Miller (guitar) as well as Shaggy’s players Melissa Musique (backing vocals), Gene Noble (backing vocals) and Kevon Webster (keyboards). Although it sounds like a ‘strange’ duo, the pair have worked together already and seem quite comfortable with each other. They seem to play well off of each other, and even though some may find it strange, they DO really sound great as a collaboration. Music videos can be found below so you can actually hear them for yourselves. Will the tour expand beyond the couple of handful of shows they’ve released so far? I guess we’ll just have to wait and see, but I know for me, it is on my list of concerts to see this year. Keep scrolling for the latest list of Official STING Tour Dates, links to look for tickets, and some cool STING music videos. 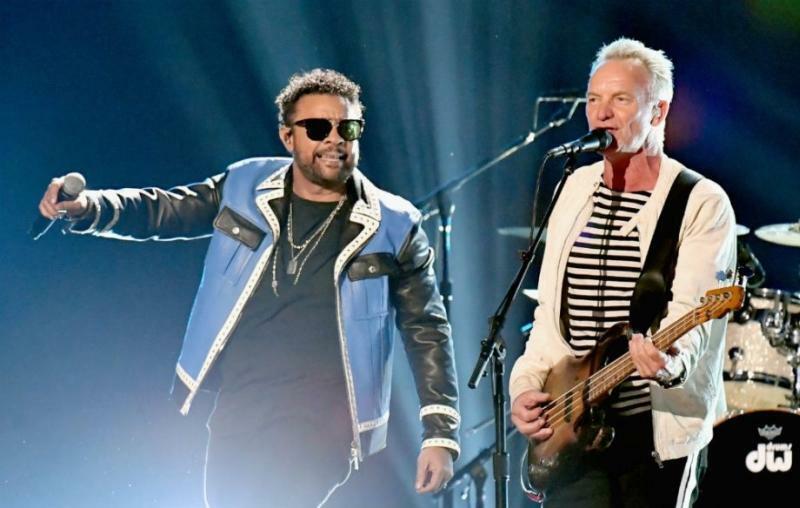 Sting performed with Shaggy at the Grammys and people were thrown for a little bit of a loop, but the duo sounded great. Check back often as we hope the duo of Sting and Shaggy add more dates to their tour schedule. MUSIC VIDEO – STING – Sting / Police Playlist – Over 100 Songs!